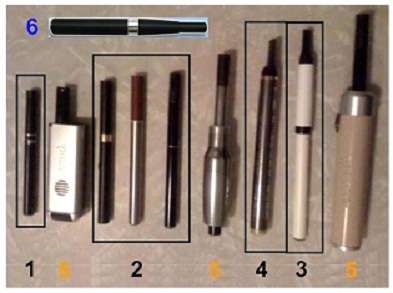 Most e-cigs fall into one of seven categories (based on length, shape, and capability). Examples of the first six are shown in this photo. 1. 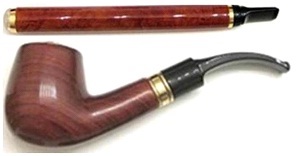 The Super-Minis – the smallest e-cigs (84–103 mm), the same size and shape as a king-size or 100s analog cigarette. Because of that, these often are initially appealing to current smokers. 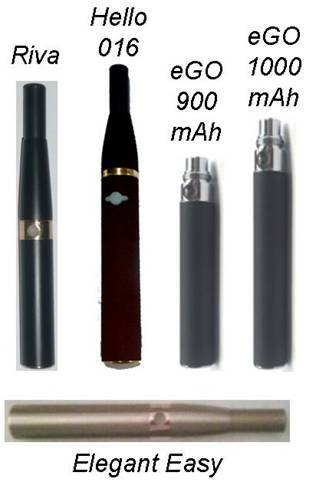 However, since they necessarily have a small atomizer and battery (90-120 mAh), they are not nearly as effective as any of the following categories. All but the RN4081 have exposed bridge atomizers. 84 mm (the smallest e-cig): the DSE084 (aka 8084) shown at the top of the group photo below (courtesy of Nikko Daniels of ECF). 89 mm (about the size of a regular filtered analog): Models include the Joye306a, the M403, and the silver & black blu shown in that photo. At 103 mm, the DSE103 and the RN4081 (often sold as Smoking Everywhere Gold or Njoy Npro) are the longest super-minis, and close in length to the shortest model in the next category. 2. The Minis – mid-length (108–118 mm), a bit longer than a 100s analog. They strike an optimum balance between effectiveness and ease of handling … and therefore are extremely popular. The two shortest models have exposed wick attys; the others are unexposed. The white and tan model in the above group photo – the DSE108 (guess what length it is). The 108 mm M401 (the next one down, black with gold design, although such color and design are selectable). Next, the black unit with a button (also shown at the left of group 2 in the photo at the top of the page) – the 112 mm Joye 510 (the most popular among forum members). It offers outstanding vapor production and its manual switch battery is the most reliable of any cigarette-shaped model, putting you in full control of the vaping experience. Its only downside is its 180 mAh battery, requiring frequent recharging. It is because of this that the Fat Batts (see the 6th category) were created, the first several of which have been based on the 510 atomizer. The silver & red unit in the photo at the top of the page – the 117mm cartomizer-based KR808D-1 (often sold under the brand names: Vapor King, Cig Easy, Nebula) is the simplest and most convenient model, with a powerful, relatively high capacity battery. 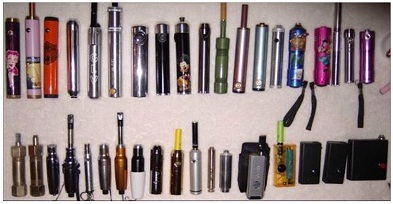 The silver unit at the bottom of the above group photo – the 118 mm DSE901 (the longest of the Minis, but much shorter than the next category) was one of the very first e-cigs. This tried and true model, until recently, typically was the one most often recommended for the new vaper and still is a very good choice, especially for those wanting an automatic battery. The RN4075 model is virtually identical, but has a low-bridge wick. 3. The Penstyles: the longest type (155 mm), the same size as a…pen (and also one of the very earliest models). It has a 280 mAh battery, providing 55% more puffs per battery charge than the Minis (other than the KR808D-1). It is my personal favorite. Models include: DSE801, RN4072, Joye302, BE112 (all of which are compatible and identical in appearance) and the M201 and Janty Kissbox. The 801 has a high-bridge wick atty; the others (I believe) are low-bridge. 5. And then there are the Mods: Unique battery housings for high-mAh and/or high-voltage generic batteries for use with previously mentioned atomizers and cartomizers. Most of the mods have been made in the U.S. and Europe, although more recently China has gotten in on the act. 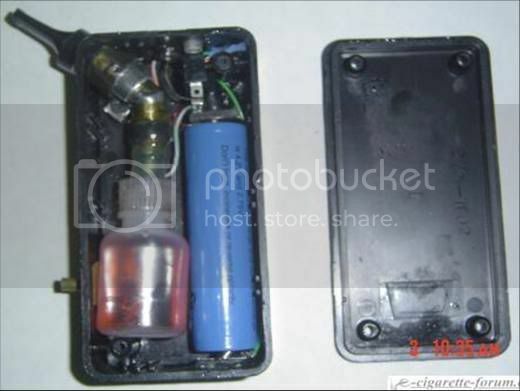 They are called “Mods,” since many started out as homebrew modifications, addressing the biggest weakness of cigarette-shaped PVs – the battery. 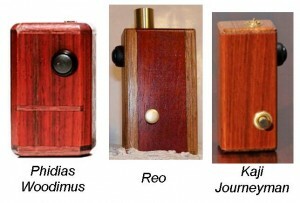 Examples are the Joye/Janty Stick, Screwdriver, and Prodigy, the first versions of which are shown in the photo at the top of the page (from left to right). As you can see from this photo of youtubecommercial‘s vast collection, most mods are large and tubular, but some are relatively small, some are box-shaped, and others are just…strange-looking. The definitive comprehensive guide to mods (in addition to our own Mods Buyers Guide , of course :)) is ViZi’s outstanding eCigarette Mods Database – a must explore for anyone even vaguely interested in mods. The “Battery Mods” (i.e., those discussed here) are organized by type: Tube, Box, and Custom (i.e., the “Fat Batts” described immediately below). See also his Battery Chart for a listing by battery type and voltage. Shown here are the types of batteries most often used in mods. 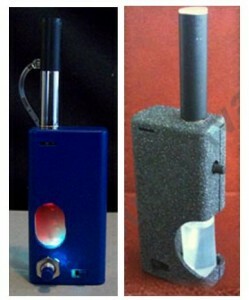 6V mods stack two of the 3.0V batteries; 5V mods do the same thing and add in a regulator or resistor. 6. The “Fat Batts” – my name for a new category, the first example of which was the Joye eGO (also sold as the Tornado) – a unique battery designed for the Joye 510 atomizer, with an accompanying cone sleeve for the atty and a silver ring with manual button in the center. The result is a PV 14 mm in diameter and 118 mm long, i.e., about 50% fatter than the 510 mini, but only slightly longer. The battery is 650 mAh – significantly greater than any of the skinny e-cig batts – and providing most of the advantages of a mod in a much smaller package. Its 3.4V is only slightly more then the 510 battery’s 3.2V. Other fat batts have followed. For the 510 atty: the 750 mAh Riva and 1300 mAh Hello 16 … and mega versions of the eGO/Tornado (the 900 mAh mega eGO and the larger 1000 mAh mega Tornado). For the KR808D-1 cartomizer and 901 atty: the 750 mAh 3.5V Elegant Easy. 7. Juice-fed Mods – Most vapers think of these as a subcategory of the mods, but what they do is so special I think they deserve their own category. Replacing both ineffective cartridges and the hassle of dripping or dipping, they are the wave of the future of vaping (although a similar claim could be made for cartomizers, which have never appealed to me personally). 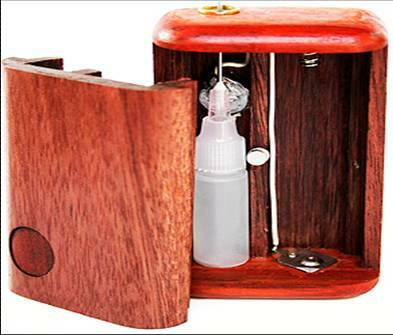 The first commercially available juice-fed mod was the Carlos Juice Box: a major breakthrough and winner of the 2009 Vapy Award for Best Hobby Mod. It contains a 2600 mAh 18650 battery and a 10-ml bottle of e-liquid. 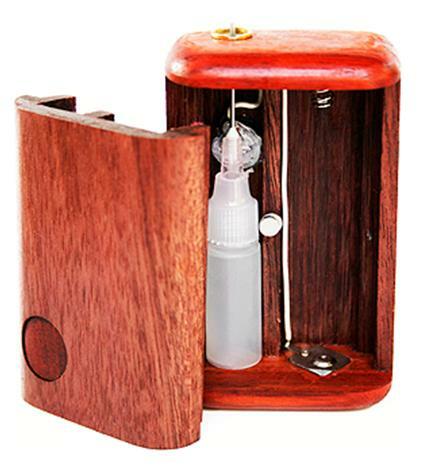 A push on the button at the side of the box injects the juice into the atomizer. It is, however, quite large, problematic, and not terribly attractive. 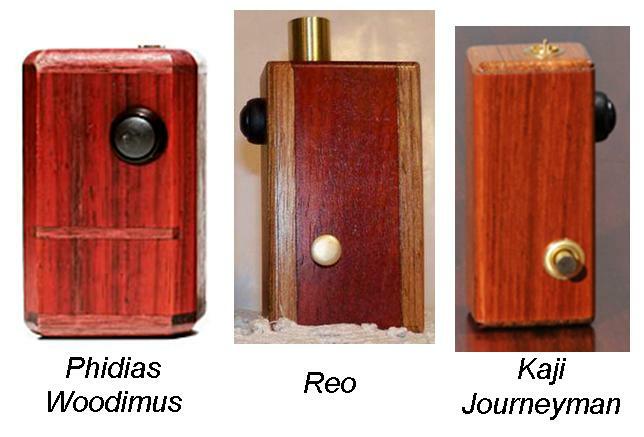 …and (influenced perhaps by NHaler’s beautiful Phidias Woodimus aka P Woodie) the more expensive 2600 mAh 18650-based wooden Reo (6-ml bottle) and Kaji Journeyman. (3-ml bottle). And Kaji has come out with the more streamlined and attractive Ali’i (6-ml bottle), described here. More information on many of the models in these seven categories can be found in Spikey’s Different Models thread, ECF’s Model Specific Discussion sub-forums. , and Parts IV and V of this WWV V2.